If you see Foryourweb.net as your home page when you start up your browser, you can be quite sure that your computer has been infected with a browser hijacker; and that may only be just the beginning. If this hijacker is on-board, it is likely that there are other malware infections as well threatening your system‘s security. Foryourweb.net changes your browser settings without your permission, which is a privacy breach in itself. Losing the control of your browsers can be rather annoying since every time you launch your browser, this search engine will be your home page. Removing Foryourweb.net is also somewhat difficult or, at least, it is made harder for inexperienced users so that they cannot restore their home pages. 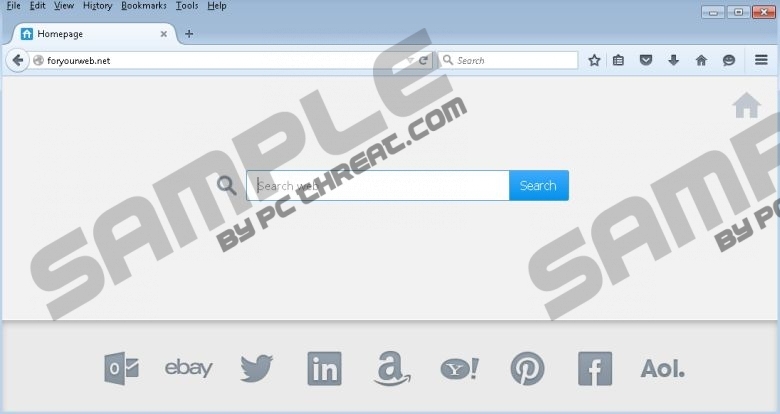 Since this intrusive browser hijacker affects the most popular web browsers, you cannot escape it if you use Mozilla Firefox, Google Chrome, or Internet Explorer. Understanding the potential risks can be vital if you want to keep your system free of infections. Right now, however, it is not Foryourweb.net that may pose as the biggest threat to your computer, but the other malware programs that may have come on-board with it. This browser hijacker is distributed in so-called bad downloaders. These are bundles that may contain malware infections, including adware programs, browser hijackers, and potentially unwanted programs as well. Such downloaders are normally promoted on unreliable file-sharing websites, freeware hosting sites, or ones that offer you to download a video player in order to be able to watch their videos. No matter how this hijacker got onto your computer, there is a good chance it did not come alone, which, obviously, means multiplied security issues for your operating system. Therefore, you had better scan your PC with a trustworthy online malware scanner after your delete Foryourweb.net. Now the question is how you can actually get rid of this silent attacker. This hijacker does not have an uninstaller, so you cannot remove it via Control Panel. Resetting your browser would also not help, since every time you do so, it would still be set as your default home page. How does it do that? Well, this browser hijacker uses a trick: It modifies the Target line. That is why you need to restore the Target lines of your browsers first before you reset your browsers. Please follow our step-by-step instructions below if you choose the manual option. But if you want to be sure that your system is all safe, we recommend the use of a reliable antimalware program to eliminate all threats that may be causing problems already. Right-click on the shortcut of your browser and select Properties. Click on the General tab and make sure the box next to Read-only is unchecked. Select the Shortcut tab and delete the part in the URL address after the quotation marks in the Target line. Click Reset settings at the bottom. Tap Alt+H and select Troubleshooting Information. Press Alt+T and go to Internet Options. Click on the Advanced tab and click Reset. Tick the Delete personal settings checkbox and press Reset. Quick & tested solution for Foryourweb.net removal.